How are we not surprised that so many of the worst decorating trends of all time come from our childhoods in the 1970s and 1980s? Shag carpeting! Orange Formica! Bean bag chairs! Popcorn ceilings! I grew up with orange and red shag carpeting in my childhood bedroom, and I hated, hated, hated it, because I could not make anything like Legos or Lincoln Logs stand up on it. Ours was Harvest Gold. Mom had the pots and pans to match. My parents had that fridge until about 6 years ago - never a problem. They've already had to replace the one they replaced it with. Those brown, green and gold 70's fridges may have been ugly, but they lasted forever! we did have an avocado refrigerator! Also yellow and avocado painted walls in the kitchen. And textured wallpaper. No shag carpetting, though. And no wood-paneled rooms. thank goodness. We had a dark brown fridge and oven to match. The avocado was all over our kitchen wallpaper, though, along with orange and a muddy yellow that Crayola would probably call "ochre." All in geometric shapes, too. Did anyone else have textured wallpaper? Our entry way was papered with gold stripes but over the stripes were white fleur-de-lis that were sort of velvety but not. Our den had the same idea but instead of "velvety but not," it was sandpaper-ish. Bizarre. Growing up I lived in a neighborhood of 1960s ranch houses. The kitchens... oh, the kitchens! Ours was brown - brown tile, brown cabinets, brown appliances - until my parents redecorated it "country" style (it was the 80s!). But my friend Alethea down the street had the best kitchen of all, all done in pink and copper. Wow. We also had a faux-wood-panelled "den" with a bitchin' tweed couch (I miss that couch). Gael- I also grew up in MN but currently live in Seattle. My bedroom growing up also had two tone orange shag carpeting. I had the very same issue with my legos! oh, god, i'm having flashbacks. the house i grew up in was last decorated in approximately 1976, and it showed. avocado green stove, sinks, shower, toilet. harvest gold drapes in the living room. avocado green & harvest gold (it was a blend!) shag carpeting throughout. 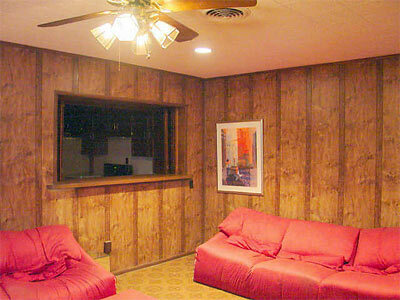 dark brown faux-wood paneling. everything looked dark and cramped all the time. the one good thing i will say about the shag is that it allowed me to skate on one of my least favorite chores in high school. my mom was really uptight about vacuuming and wanted me to do it every day after school, but i hated to vacuum and thought every day was ridiculous. so i did it twice a week instead and just ruffled the shag with my foot on the off days. she never caught on. Oh yes, we had the avacado fridge and oven. Not to mention a well paneled family room with orange shag carpet. That carpet made it difficult to run my remote controlled car on. We replaced the paneling with a tweed wallpaper the the cat loved to climb. He'd be handing out on the wall much like Garfield on a screen door. Awesome memories. I'd forgotten about the velvet-but-not-really wallpaper. What was the deal with that? I'll bet the hooky side of Velcro would have stuck to it, no problem. Also, our early-'70s-built house had actual shingles on top of the kitchen cabinets, like a jaunty -- and quickly out of date -- wooden hat. Whaaa? No flocked wallpaper, but we had a harvest gold fridge, and a basement rec room with cheesy paneling and that bad-taste classic, the "carpet sample patchwork floor". In your basic seventies color scheme of yellow, orange, booger-green, & brown. My best friend's house had a powder room in black, white & red--and awesome wallpaper printed with pages from the 1908 Sears catalog. There was always something to read in that bathroom.